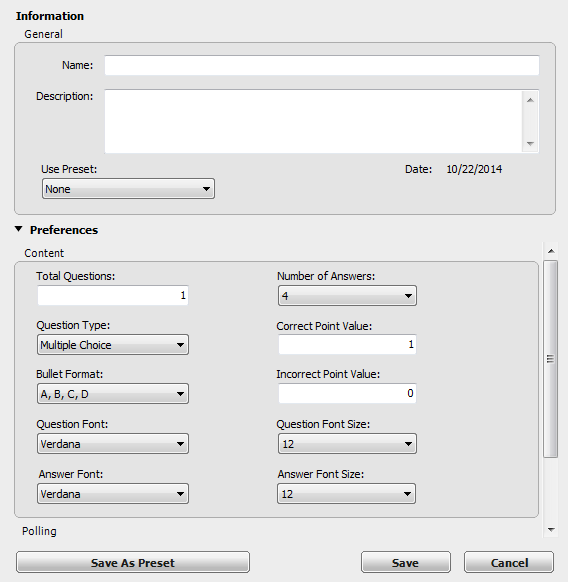 When creating a question list, the preferences can be saved and used as a template for future question lists. Open TurningPoint Cloud and sign in to your account. Click Content, mouse over New and select Question List. The Question List window opens. Enter a name and a brief description for the question list. Click the arrow next to Preferences to expand the window and adjust the options as necessary in the Content and Polling sections. Save the preferences as a preset for other question lists. Click Save as Preset, provide a name, click Add and then Save. The next time a question list is created, select the name from the Use Preset drop-down menu. 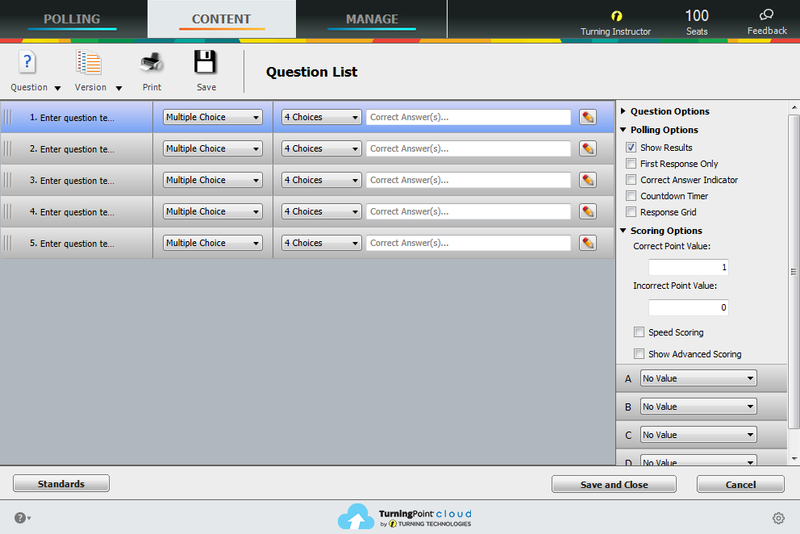 The Question List Editor is displayed. Select the question type from the drop-down menu. Enter the correct answer in the field provided if necessary. Questions may be added, deleted, duplicated or rearranged within the question list. To add, delete, or duplicate questions click . To rearrange the order of the questions, click the area to the left of the question number and drag the question to the new location. Double-click enter question text to enter questions and answers. Entering this text allows TurningPoint Appparticipants to view the text on their web-enabled devices.